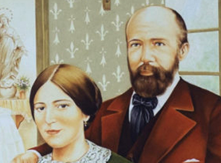 - the heroic virtues of the Servant of God HEINRICH HAhN, layperson of the diocese of Aachen; married; born on 29 August 1800 in Aachen (Germany) and died there on 11 March 1882 . - the heroic virtues of the Servant of God Teresio Olivelli, layperson of the diocese of Vigevano; born on 07 January 1916 in Bellagio, Como (Italy) and died on 17 January 1945 at KL Hersbruck, Nürnberger Land (Germany). - the heroic virtues of the Servant of God HANNA CHRZANOWSKA, layperson of the diocese of Kraków and member of the Oblates of the Order of Saint Benedict; born on 07 October 1902 in Warsaw (Poland) and died on 29 April 1973 in Kraków (Poland). - the heroic virtues of the Servant of God ISABEL MÉNDEZ HERRERO (in religion: ISABEL OF MARY IMMACULATE), founder of the Congregation of the Servants of Saint Joseph; born on 30 August 1924 in Castellanos de Moriscos, Salamanca (Spain) and died on 28 December 1953 in Salamanca (Spain). 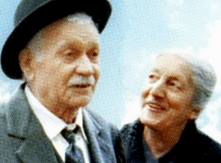 LOUIS MARTIN and MARIE-AZÉLIE GUERIN MARTIN, married couple. The Holy Father decreed that these Blesseds will be inscribed in the catalog of saints on Sunday, 18 October 2015. - the heroic virtues of the Servant of God RACHELE LALÍA (in religion: MARIA ANTONIA OF THE SACRED HEART OF JESUS), founder of the Congregation of the Missionary Dominican Sisters of San Sisto; born on 20 May 1839 in Misilmeri, Palermo (Italy) and died on 09 April 1914 in Ceglie Messapica, Brindisi (Italy). VATICAN CITY - On Tuesday, 5 May 2015, Pope Francis received in a private audience Cardinal Angelo Amato, sdb, prefect of the Congregation for the Causes of Saints. J. Serra V. Grossi P. Salvat G. Abbondo M. Vergara Thoj Xyooj P.
In the course of the audience, the Holy Father confirmed the affirmative vote of the Ordinary Session of the Cardinals and Bishops of the Congregation for the Causes of Saints on the proximate canonization of Blessed MIGUEL JOSÉ SERRA FERRER (in religion: Junípero), professed priest of the Order of Friars Minor; born on 24 November 1713 in Petra, Mallorca (Spain) and died on 28 August 1784 in Monterrey, California (United States); beatified on 25 September 1988. - the heroic virtues of the Servant of God Domenica Bedonni Bernardini, layperson of the archdiocese of Modena-Nonantola; married; born on 12 April 1889 in Verica, Modena (Italy) and died on 27 February 1971 in Modena (Italy). - the heroic virtues of the Servant of God ORSOLA BUSSONE, young layperson of the archdiocese of Turin; member of the Focolare Movement; born on 02 October 1954 in Vallo Torinese, Turin (Italy) and died on 10 July 1970 in Ca’ Savio, Cavallino-Treporti, Venice (Italy). VATICAN CITY - On Saturday, 21 February 2015, Pope Francis received in a private audience Cardinal Angelo Amato, sdb, prefect of the Congregation for the Causes of Saints. During the same audience, the Holy Father confirmed the affirmative vote of the Plenary Session of the Cardinals and Bishops of the Congregation for the Causes of Saints, on the title of Doctor of the Universal Church which will soon be given to Saint Gregory of Narek, monk and priest, born in Andzevatsik (then in Armenia, now Turkey) at about 950 and died in Narek (then in Armenia, now Turkey) at about 1005. Saint Gregory of Narek [Գրիգոր Նարեկացի (Grigor Narekatsi)] is widely revered as one of the greatest figures of medieval Armenian religious thought and literature. He came from a line of scholars and churchmen. He received his education under the guidance of his father, Bishop Khosrov, author of the earliest commentary on the Divine Liturgy, and from Anania Vartabed, abbess of Narek Monastery. He and his two brothers entered monastic life at an early age, and Saint Gregory soon began to excel in music, astronomy, geometry, mathematics, literature, and theology. He became a priest at the age of 25 and dedicated himself to God. He lived most of his life in the monastery of Narek, where he taught at the monastic school. Saint Gregory began his writings with a commentary on the “Song of Songs,” which was commissioned by an Armenian prince. Despite his reservations that he was too young for the task, the commentary became famous for its clarity of thought and language and its excellence of theological presentation. He also wrote a number of famous letters, sharagans, treasures, odes, melodies, and discourses. Many of his prayers are included in the Divine Liturgy celebrated each Sunday in Armenian Churches around the world. Saint Gregory’s masterpiece is considered to be his Book of Lamentations. Also known as Narek, it is comprised of 95 prayers, each of which is titled Conversation with God from the depth of the heart. A central theme is man’s separation from God, and his quest to reunite with Him. Saint Gregory described the work this way: “Its letters like my body, its message like my soul.” He called his book an “encyclopedia of prayer for all nations.” It was his hope that it would serve as a guide to prayer for people all over the world. After the advent of movable type, the book was published in Marseille in 1673, and has been translated into at least 30 languages. Saint Gregory of Narek is remembered by the Armenian Church on 13 October of each year. VATICAN CITY - At 11 a.m. today in the Vatican Basilica, Pope Francis celebrated an Ordinary Public Consistory during which he created twenty new cardinals. MARYAM BĀWARDĪ [BAOUARDY] (in religion: MARIE OF JESUS CRUCIFIED), professed nun of the Order of Discalced Carmelites. The Holy Father decreed that the canonization ceremony for these three, along with Blessed ADELAIDE BRANDO (in religion: MARIA CRISTINA OF THE IMMACULATE CONCEPTION), founder of the Congregation of the Oblation Sisters of the Blessed Sacrament - whose canonization was decided during the Consistory of 20 October 2014 - will take place on Sunday, 17 May 2015. - the heroic virtues of the Servant of God GIOVANNI BACILE, priest of the diocese of Monreale; born on 12 August 1880 in Bisacquino, Palermo (Italy) and died there on 20 August 1941. - the heroic virtues of the Servant of God VIRGINIA BLANCO TARDÍO, layperson of the archdiocese of Cochabamba; born on 18 April 1916 in Cochabamba (Bolivia) and died there on 23 July 1990.